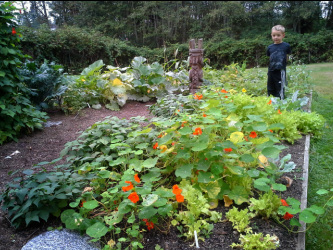 Grandson, Jack Harkins, exploring the mature garden. We don't have specific guidelines in place for future garden involvement, ie. club, but we are open to all ideas. We have decided to make this a family "club" as opposed to kids only. If you are interested in volunteering to help with the garden in any way: teaching, publicizing, working, planting, and harvesting foods as they ripen, please let us know. An email to: info@genenastrischool is always welcome. For anyone new to organic gardening or just to learn about and compare gardens, this year's experience has been invaluable. Laura is a fountain of knowledge. One great pleasure is to see students and parents visiting with her, or our students' parents sharing the garden with their children, and our art teacher, Shelly Hendrickson, taking her students down to the garden's edge to observe and discuss plants and colors and designs. She may be new to us, but Laura McCarty is a familiar name to many here in Mukilteo. She and her husband, Cameron, raised their son Rory here - he graduated from Kamiak in 2004. Laura has a wide variety of interests - particularly in art and gardening, a fine fit with Gene Nastri School and the beautiful piece of land on which we find ourselves. She has been actively involved in the Mukilteo Community Garden for some time and has taken training at the WSU extension program for Growing Groceries and Sustainable Community Stewards. She has extensive experience mentoring community gardeners and a life-long passion for learning and sharing information, particularly about gardening. Laura studied liberal arts at Scripps College, earning an AB from Berkeley, and a Masters in Library Information Science from the University of Washington. She has enjoyed bee keeping, earned a beekeeper's certificate from the WA State Beekeepers Association and kept bees during the 1990's. She also found time to produce and engineer articles for airing on KSER 90.7FM community radio on local agriculture, food banks, and community gardens.